Clermont County is vulnerable to a variety of hazards that threaten its residents, businesses, and environment. Clermont County’s Emergency Operations Plan (EOP) establishes the framework to ensure that the county; cities, townships, and villages that are contained within the county; and the cooperating private and non-governmental organizations will be adequately prepared to deal with these hazards. The EOP outlines the roles and responsibilities for all participating agencies and organizations. 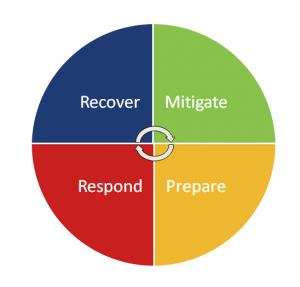 Emergency management is carried out in four distinct phases: mitigation, preparedness, response and recovery. Mitigation: actions that are taken before or after an emergency to eliminate or reduce the long-term risk to human life and property from natural, technological, and human caused hazards. Preparedness: a continuous cycle of planning, training, resource acquisition, and exercises to ensure effective coordination and the enhancement of capabilities to prevent, protect against, respond to, and recover from disasters. Response: the mobilization of the necessary emergency services to minimize the loss of life and property following a disaster. Recovery: short and long-term activities which return the affected area/systems to normal or improved standards. 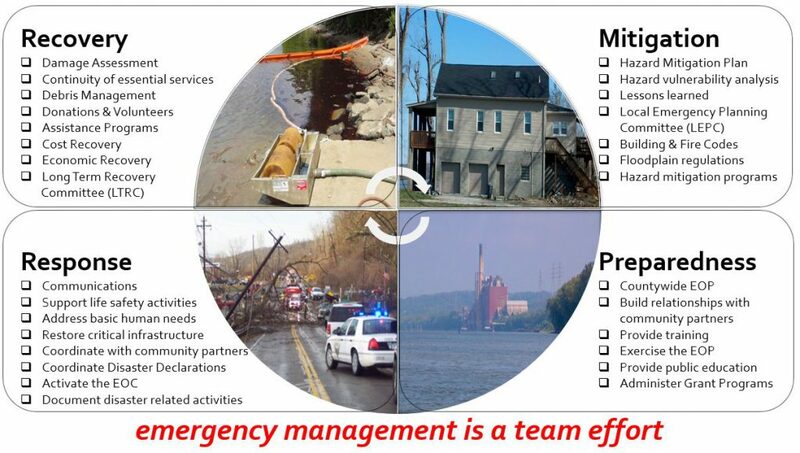 Basic Plan – the Basic Plan outlines in general terms how Clermont County will mitigate, prepare for, respond to, and recover from a disaster. The Basic Plan addresses the different hazards that could impact the county, the responsibilities of the various government agencies, method of operations, financial management policies that will be adhered to in an emergency and continuity of government. The Basic Plan also contains a section that addresses recovery issues to ensure a rapid and orderly implementation of rehabilitation and restoration programs for persons and property affected by a disaster. Emergency Support Function (ESF) Annexes – The emergency support function structure is patterned after the federal system as outlined in the National Response Framework (NRF) and contains, at a minimum, the responsibilities of the primary and support agencies that will respond. Support Annexes – provide standard operating guidelines on specific response and recovery activities that have not been covered in the ESF Annexes. Hazard Specific Annexes – although the Plan is comprehensive in scope, there are several hazards that the County is vulnerable to that have special circumstances and situations that are only relevant to that specific hazard. Develop a formal Hazardous Weather Plan, which includes training severe weather spotters and hosting emergency exercises.